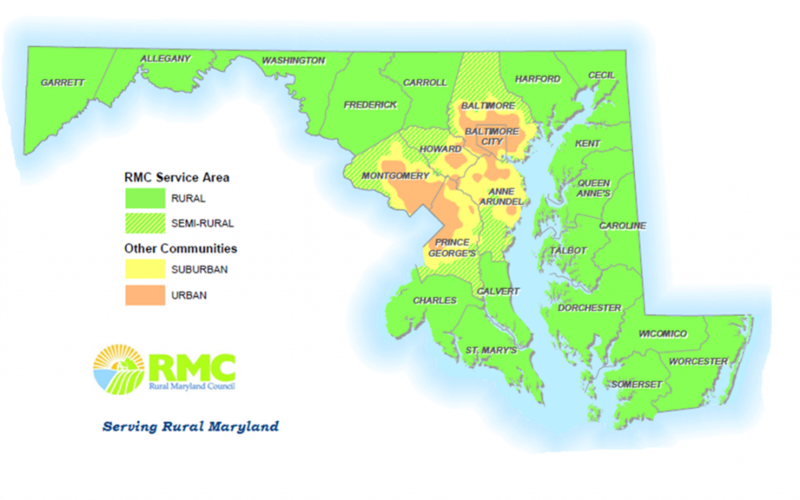 The Rural Maryland Council (RMC) brings together citizens, community-based organizations, federal, state, county and municipal government officials as well as representatives of the for-profit and nonprofit sectors to collectively address the needs of Rural Maryland communities. We provide a venue for members of agriculture and natural resource-based industries, health care facilities, educational institutions, economic and community development organizations, for-profit and nonprofit corporations, and government agencies to cross traditional boundaries, share information, and address in a more holistic way the special needs and opportunities in Rural Maryland. Encourage healthy, connected communities throughout Rural Maryland through convening of stakeholders, education, public relations, and advocacy. Support the development and growth of vibrant economies in Rural Maryland. Foster stewardship of Maryland’s natural resources. Maximize RMC outreach, resources and mission through financial and organizational development. As a collaborative partnership, the RMC operates in a nonpartisan and nondiscriminatory manner. Policy-makers and managers from stakeholder agencies and organizations at all levels of government and the private sector are valued participants. Where practical, the decision-making undertaken by the RMC is made by reaching consensus. RMC’s vision is a future where all of Rural Maryland is prosperous with thriving resources, vibrant economies, and healthy, connected communities. How do we Define Rural in Maryland? Rural jurisdictions share common characteristics that set them apart from their suburban and urban counterparts, such as geographic isolation, lack of transportation, and lack of access to and availability of health care. The state definition of rural is articulated in the Annotated Code of Maryland and includes 18 of the 24 jurisdictions in Maryland. Each is represented on the Rural Maryland Council. Allegany, Calvert, Caroline, Carroll, Cecil, Charles, Dorchester, Frederick, Garrett, Harford, Kent, Queen Anne’s, Somerset, St. Mary’s, Talbot, Washington, Wicomico and Worcester.